Childhood obesity rates have seen a dramatic increase over the past 30 years, and it’s not just genetics that may raise a child’s risk of becoming obese. Behavioral and environmental factors can also make a child more susceptible to developing excess body fat. The food choices kids make can greatly impact their overall health. As kids get older, it becomes even more important for them to understand what’s in their food. That’s why the FDA wants to help kids learn how to read nutrition labels. Information listed on Nutrition Facts labels can be difficult for kids to understand. But in teaching kids how to read food labels, parents can arm them with a better understanding of how their food may affect their health. September is National Childhood Obesity Month. Here’s how parents and caregivers can help young people learn how to read food labels. Check the serving size. 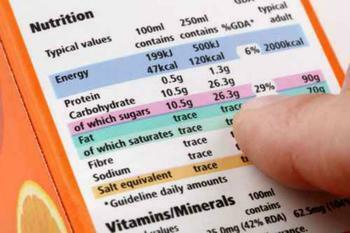 First, adults should teach kids that all information listed on Nutrition Facts labels is based on one serving of food. It’s important to note, however, that foods often contain more than one serving. Sticking to the serving size is a crucial element of keeping calorie intake in check. Look at the calories. Obesity is caused by caloric imbalance, or a failure to balance calories consumed with calories expended. Preventing an imbalance from occurring can be achieved by considering the calories in food. The FDA notes that 400 calories per serving in a single food item is too high; 100 calories is moderate. Watch out for certain nutrients. Not all nutrients should be consumed in large quantities. Saturated fat, sodium, and added sugars are on the list of nutrients kids should get less of. Teach kids to look for Percent Daily Values (%DV) of 5% or less of these nutrients. Anything over 20% DV is too high.